John Timpson CBE, Chairman of the Timpson Group, one of the largest privately-owned retailers in the country with whom we have worked closely for 18 years now, renewed his call on the Chancellor of the Exchequer to freeze business rates for retailers in the wake of several high profile retail business failures this month. 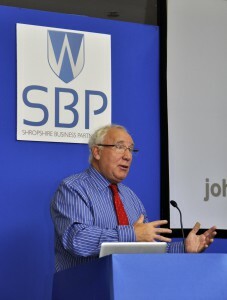 John generously accepted my invitation to speak to the Shropshire Business Partnership (SBP), a network group for whom we handle the PR, which promotes collaboration amongst professional business services providers in Shropshire. And so it was that John addressed a sell-out first SBP breakfast meeting of 2013 at the Greenhous Meadow stadium, Shrewsbury last Friday [18th January]. In an uncompromising attack on the government’s plan to increase business rates again this year, the retail magnate, who expects to open his 1,000th shop in the UK during 2013, was upbeat about the health of the high street despite recent high profile retail failures such as Jessops, Blockbuster and HMV. Having worked so closely with the Timpson business for very many years, first in managing John’s personal and corporate reputation and latterly producing the Timpson Group’s weekly staff newsletter, I have developed a keen interest in the retail sector. The failure of Jessops’ HMV’s and Blockbuster Video’s leadership teams to reinvent their proposition is tragic when 5,000+ employees’ jobs are at stake. John Timpson epitomises how a visionary retailer, who not only sees the writing on the wall but acts quickly to make tough decisions, can save a business. He highlighted in his talk just how he did that in the early 1980s by selling the shoe retailing side of the Timpson business whilst retaining the more profitable shoe repairs division and then diversifying. Membership of the SBP is FREE. You can find out more at: http://www.shropshirebusiness.org/. There are plenty of photos from the John Timpson CBE breakfast event on our Facebook page.